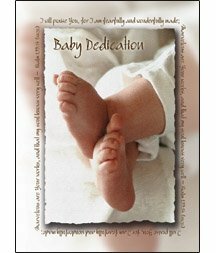 Baby Dedication Certifcate - 5x7 folded, Premium, Full Color (pack of 6) by Warner Press at Easy Blogging Tip. MPN: U2469. Hurry! Limited time offer. Offer valid only while supplies last. Cover Text BABY DEDICATION I will praise You, for I am fearfully and wonderfully made; Marvelous are Your works, and that my soul knows very well. Cover Text BABY DEDICATION I will praise You, for I am fearfully and wonderfully made; Marvelous are Your works, and that my soul knows very well. Psalm 139:14 (NKJV) Inside: Baby Dedication This certifies that (blank line) was dedicated to God at (blank line) on (blank line) Mother (blank line) Father (blank line) Minister (blank line) Product Information Beautifully designed for contemporary or traditional tastes, Baby Dedication certificates offer quality, style and variety -- a wonderful addition to celebrating those special occasions in a believer's life. UPC: 730817327792 Shrink wrapped package of 6 with white envelopes Size: 5'' x 7'' folded, Premium stock, Full Color (NKJV) - The Holy Bible, New King James Version Copyright © 1982 by Thomas Nelson, Inc. If you have any questions about this product by Warner Press, contact us by completing and submitting the form below. If you are looking for a specif part number, please include it with your message.